A revolution 50 years in the making? With standing room only for Future Energy Strategies' seminar on shale gas last week, there's no doubt what the big excitement in energy is right now. Shale... It's the new thorium! This is all a bit strange for something that relies on a technique that's 50 years old. Shale gas drilling licences were snapped up in 2002, and two years ago, production began to tip market prices significantly for both gas and oil – the two diverged for the first time ever. Yet still, news hadn't broken beyond the trade silo, for the political classes to digest the implications. 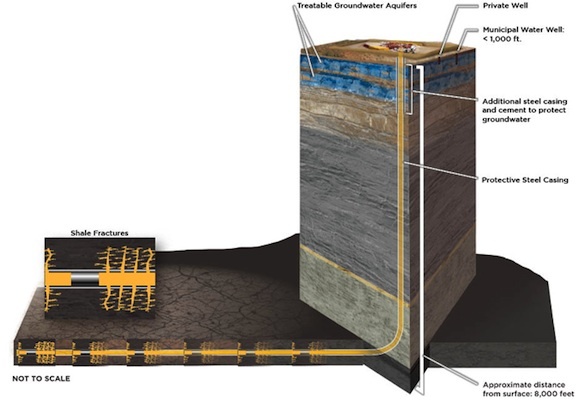 Shale gas relies on the combination of two techniques – horizontal drilling and the hydraulic fracturing of rock. The rock is blasted using a liquid that's usually water with sand and a cocktail of lubricants added. The drilling goes deeper (7,000 to 12,000m) to draw the gas up from impermeable rock. At the seminar we heard from a skeptic, a proponent, and a practitioner who has been setting up wells (they still call them wells, naturally) in Poland for five years. There were also some interesting exchanges with a couple of professional environmentalist campaigners. Gas markets consultant Leigh Bolton of Holmwood Consulting gave a wary view of shale's prospects. It was a comprehensive catalog of concerns, focusing on the difficulties of drilling and uncertainty of return, rather than eco-alarmism. Bolton said that the European experience of shale would be very different to that of the US. Partly this was because of the high population density, but also because of red tape, and the lack of a services infrastructure here. By contrast, the US has a tradition of wild-catting, and established services pop up as soon as excavators need them. This means higher costs. Bolton reckoned the new shale plays require a gas price of $6 MMBtu (per million Btu), whereas the US gas price is closer to $4.5 MMBtu. "The liberalised market price in Europe won't match it for many years," he predicted. Nobody could be more bullish than long-time advocate Nick Grealy, who has been both an energy provider and buyer (for the NHS) in his time. In 2008 he started the No Hot Air blog, before most people here had heard of shale. Grealy began by ridiculing the current political wisdom. He quoted Energy secretary Chris Huhne, who had declared that "Left untouched, the electricity market would allow a new dash for gas, increasing our dependence on a single fuel, and exposing us to volatile prices". That's rubbish, he said, because we'd be able to generate our own gas so cheaply, in such abundance. Grealy described gas as the cheapest low-carbon fuel source, winning support from eco-warriors ranging from the Sierra Club to The Hon Sir Jonathan Porritt. One field alone in populous Texas, Barnett Shale, has produced 226bn cubic metres (BCM) since 2004. The UK needs to import 10.4bn cubic metres of gas. A few fields here could see Britain exporting LNG – something the US shale producers are already doing in volume. He said every pessimistic estimate to date had been proven wrong – the recoverable reserve estimates in Argentina and India had grown tenfold and twentyfold respectively in just two years. "The UK's energy policy depends on the perception of insecure and expensive gas. Instead we have expensive solutions to a problem we'll no longer have." Exploiting the UK's shale could bring in a 5550 per cent reduction in CO2 emissions by 2020 2025, at no cost in subsidies or higher energy bills. Attempts to pursue low-carbon strategies by other means were vain, he said. "Why give people a £5,000 subsidy to buy an electric car to assuage their guilt for working in the City?" he asked the City audience.